Pokerati » Blog Archive » Online Poker on the Uptick? PokerStars’ New Jersey Launch In October? Now for poker players, we realize these are not knock-your-socks-off big numbers. But they represent growth. Not booming growth, mind you, but more the slow, smart and sustainable type. It’s significant enough money in play for Mike Sexton (and presumably others) to be consciously choosing to play Day 1B of the WPT Borgata Poker Open main event so they can also play in the main event of the Garden State Super Series (without being distracted by an iPad at the table). Though I’m a little too far removed from Atlantic City to know if there’s an online-poker refugee or commuter culture sprouting up, we do know with events like the Garden State Super Series that the players are indeed showing up online, and this has everything to do with cooperation with a live casino such that both operations are ready to serve their players wherever they are seeking certain action. 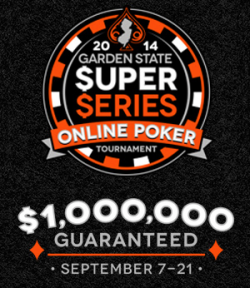 The GSSS has already paid out more than $250,000, and has another $400,000 in guarantees starting Sunday. So far they’ve hit 14 out of 15 guarantees, so while not ridiculous, mind-blowing sums, it does give a sense of the significant and reliable American cash circulating in the New Jersey online poker economy. Add it all up and you’re seeing a new era, with players who are ready, and both online sites and brick and mortar casinos doing the right things to integrate social players, recreational weekend warriors, and grinder pros alike … mixing it up for a vibe that in some ways isn’t too different from what partypoker was going for in the earliest days of poker coming of age.